I’m making cinnamon rolls in preparation for General Conference this weekend! I got the idea here. 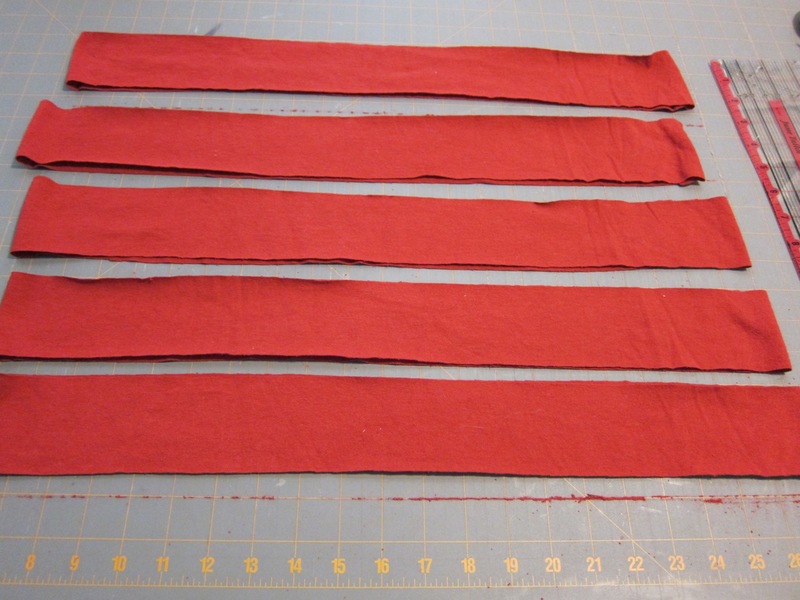 I thought about making them Saturday morning, but they take about three hours to make, so I’m making them tonight while I have energy and time. I’m using the recipe from The Food Nanny cookbook for the rolls themselves, but I’ll use a different recipe for the icing, because it calls for cream cheese and we don’t have any. I made half of the recipe in my bread machine, using almond milk instead of dairy milk, melted the butter for the filling (idea from the Pioneer Woman), rolled them up, and got twice as many (20) as I expected from half a recipe. Of course, I added in a bit extra flour (the bin tipped a bit too much–note to self, measure extra flour instead of pouring it in from the canister), and thus had to add extra almond milk. Right now, they’re doing their final rising time before I bake them. I hope to freeze any extras (if there aren’t extras, then we’re going to be in sugar overload) for after-work treats or weekend breakfasts. If I have time, energy, and clean dishes tomorrow, I might make chocolate-filled crescent rolls (also from The Food Nanny cookbook). 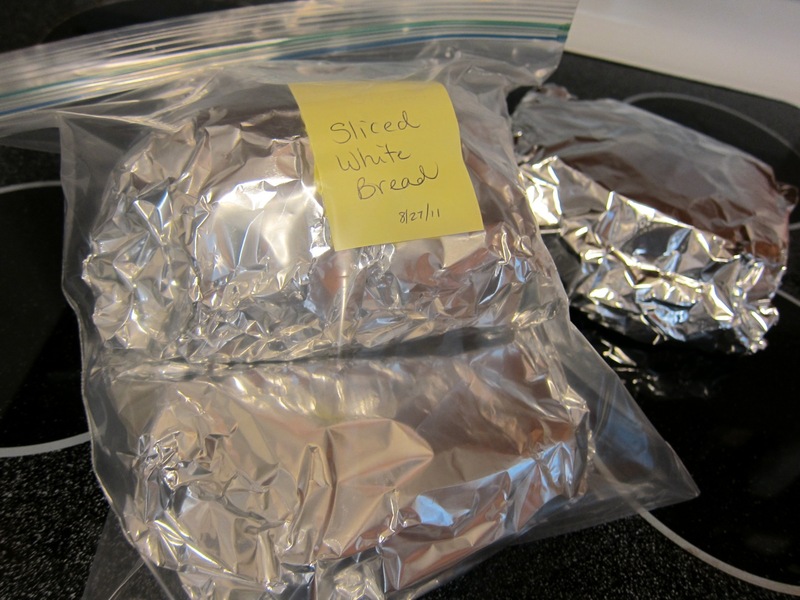 They’ll also be good for after-work chocolate cravings and will hopefully freeze well. I’ve been eating vegan chocolate chip cookies and dairy milk after work this week, so it will be nice to have additional sweet treats once the cookies run out (which will happen very, very soon). 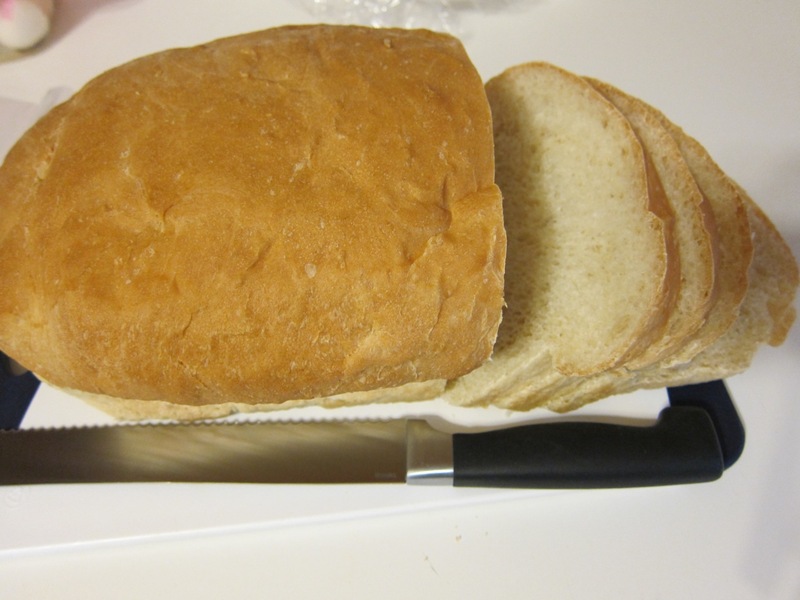 In an effort to eat healthier foods, know exactly what’s in the foods I’m eating, and to save money at the grocery store, I enjoy making my own bread. 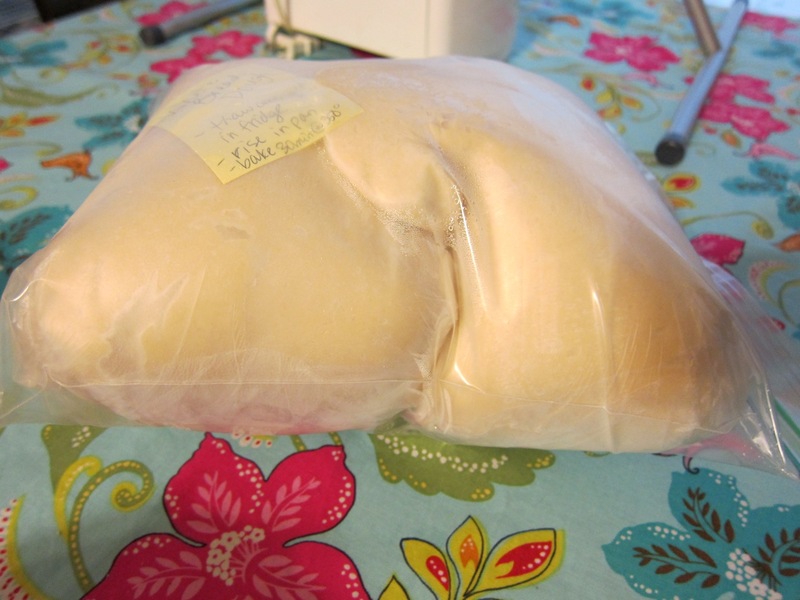 The problems I have are that we don’t always get the loaf eaten before it goes bad (homemade doesn’t last for weeks like store-bought), and that I don’t always have time to make bread. 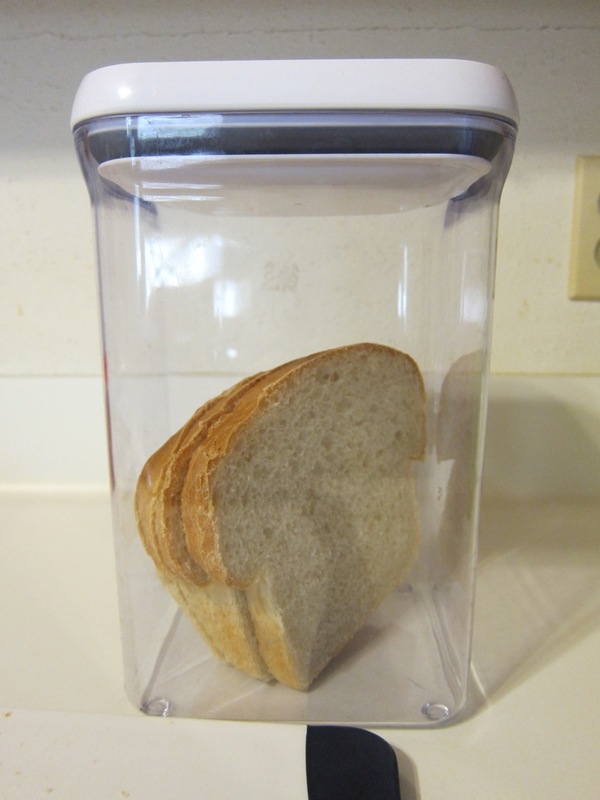 I recently decided to make bread using the Food Nanny cookbook. The recipe made three loaves, so I decided to bake one loaf and freeze the dough for the other two. 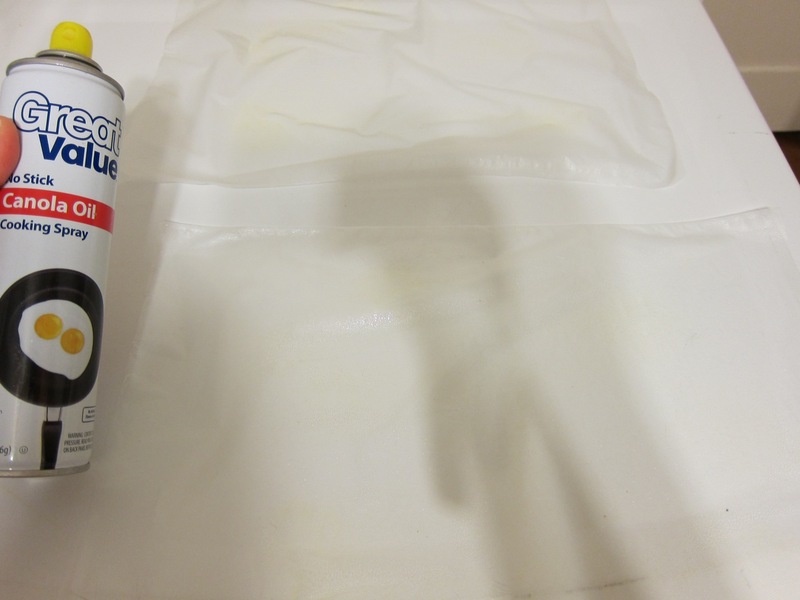 Spraying plastic wrap for wrapping dough. 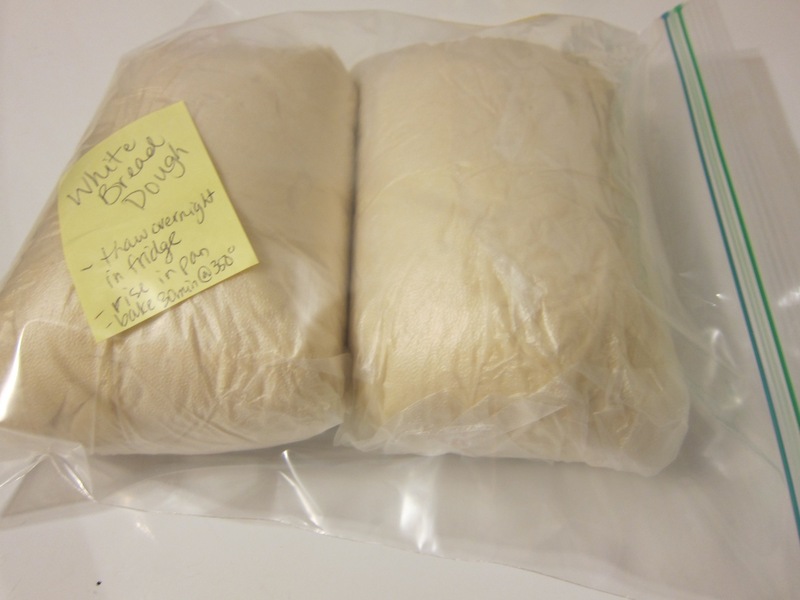 I wrapped the dough in two layers of plastic wrap and then put it in a freezer bag. It kept rising in the freezer! Maybe, I didn’t wrap it tight enough. Either that or my freezer took so long to freeze it that it had time to continue rising. 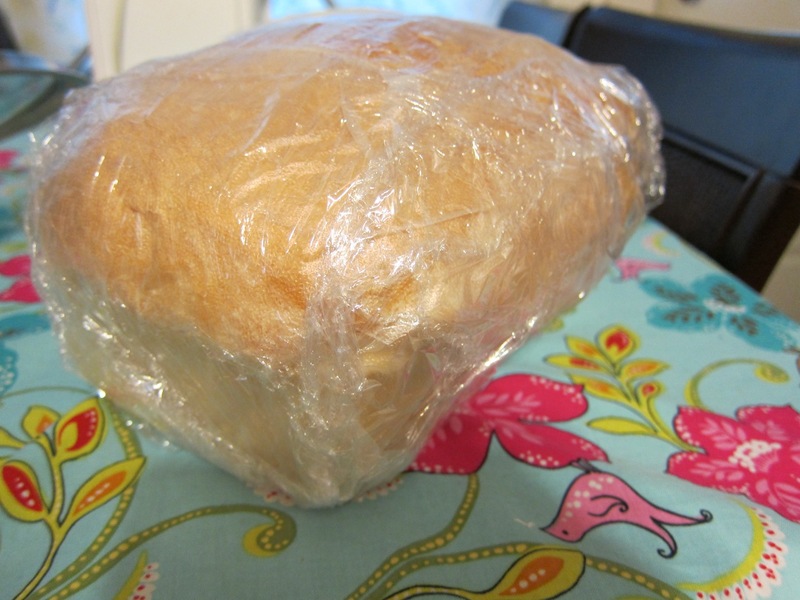 When I want to bake a loaf, I’ll defrost it in the fridge overnight, and then let it continue rising on the counter. 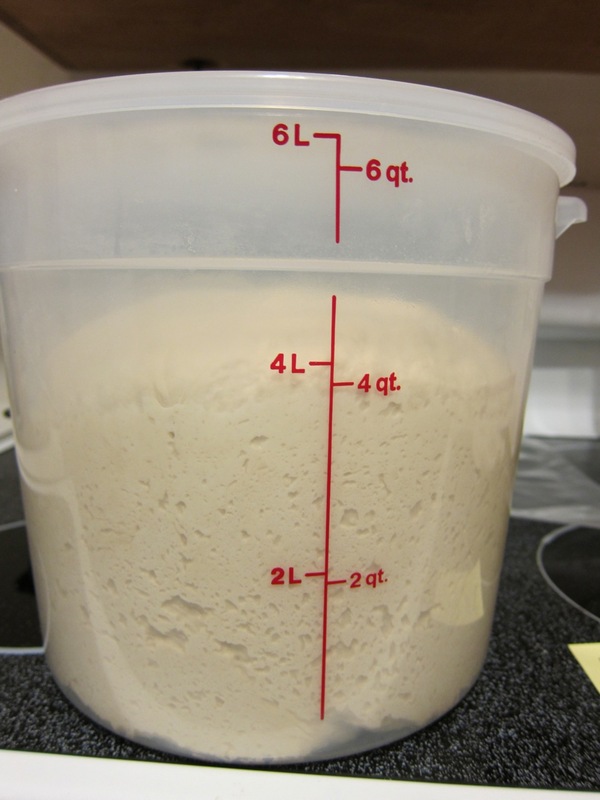 Then, I’ll bake it for 30 minutes at 350 degrees. 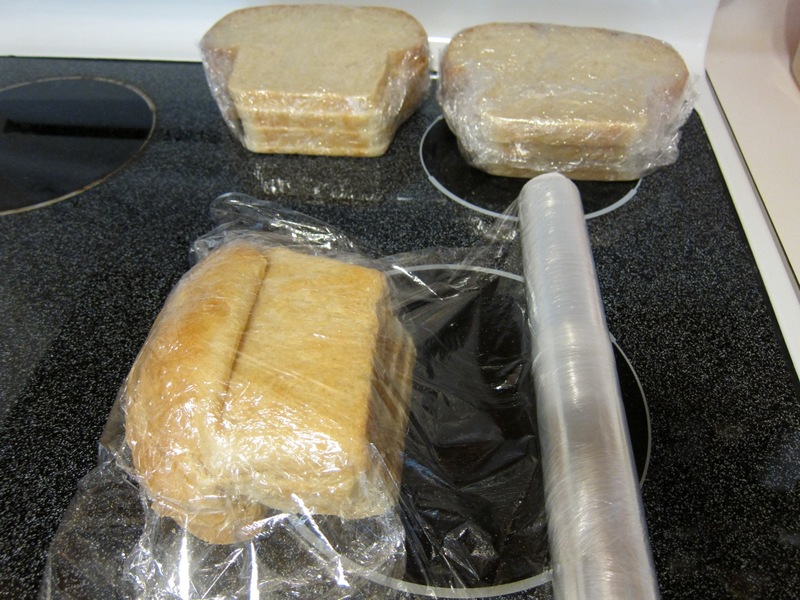 I wrapped the other slices in plastic wrap, about 4 slices per package. 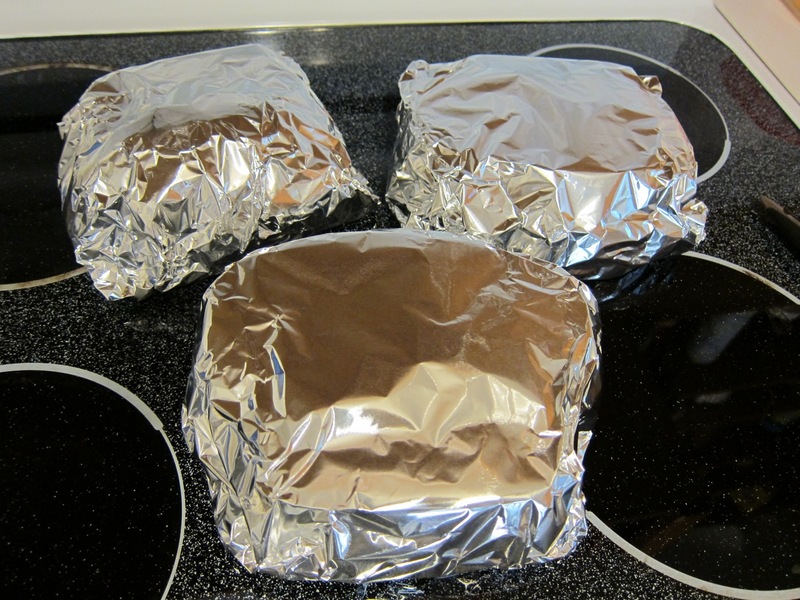 Then, I wrapped each set in foil. After that, I put them in freezer bags. As they come out of the freezer, I’ll have sliced bread ready to go! Also, I’ll reuse the foil and baggies. 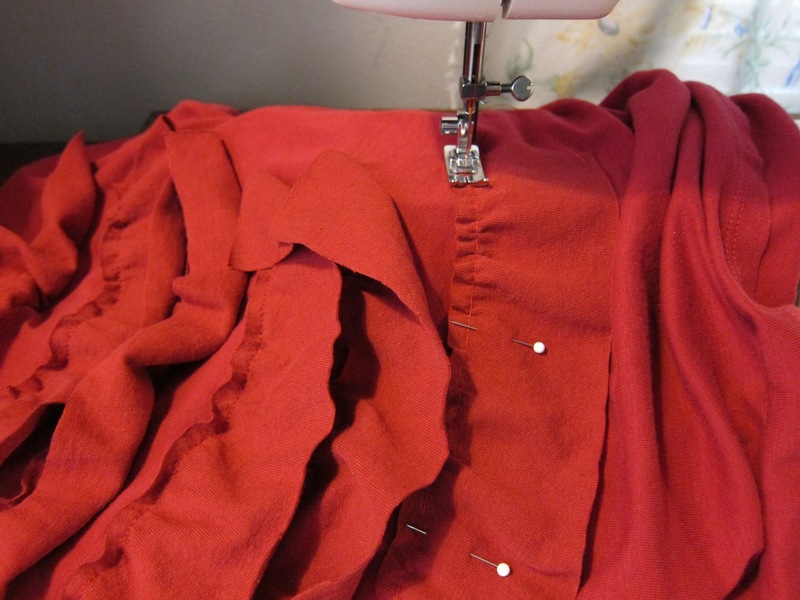 This is Part 2 of 2 for sewing a red ruffle shirt. 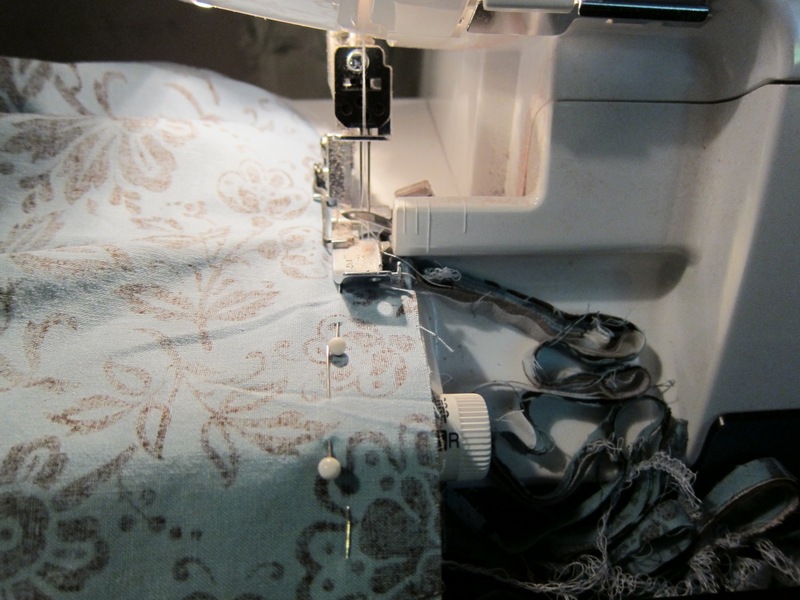 Click here for the instructions (Tea Rose Home). 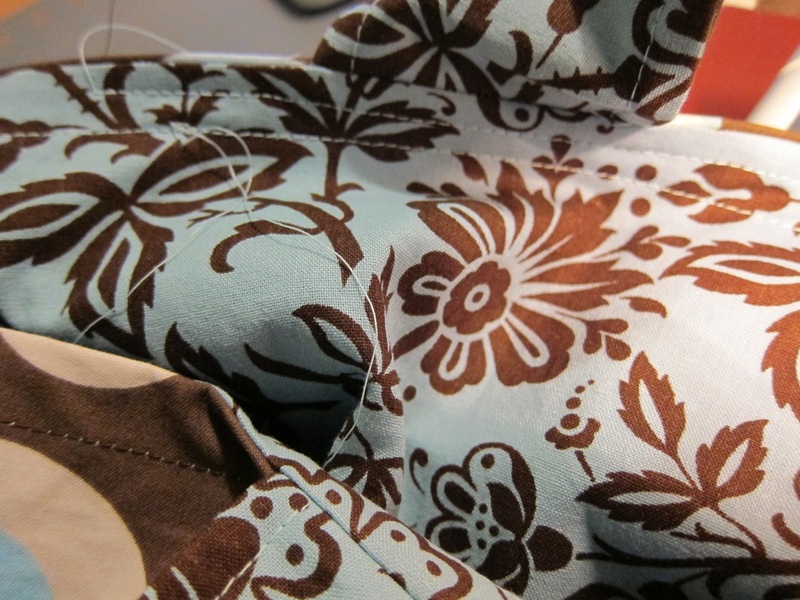 So far, we’ve sewn the ruffles on to the shirt. 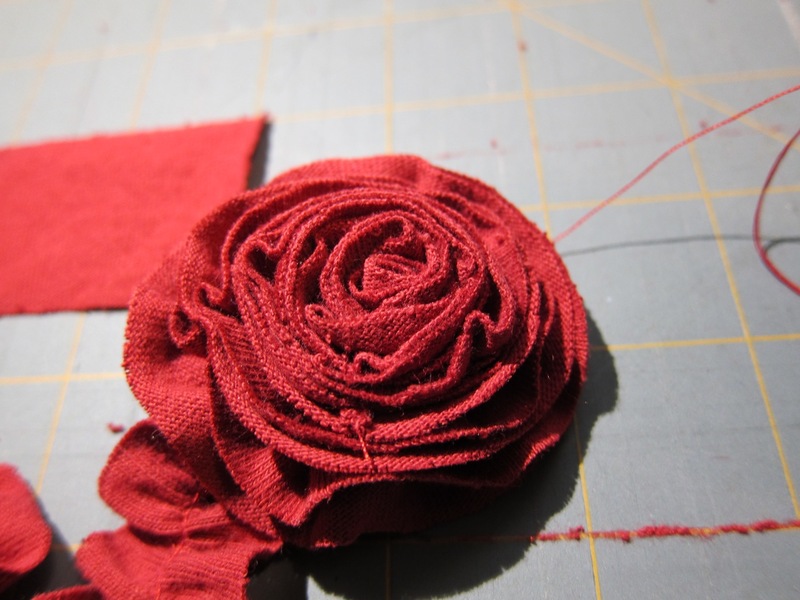 Now, it’s time to make the fabric roses. 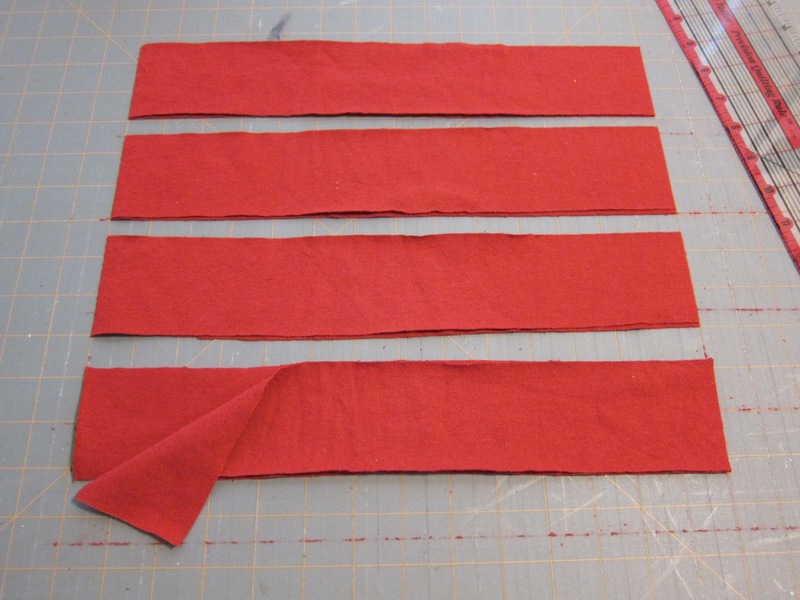 Cut strips of fabric according to the instructions. 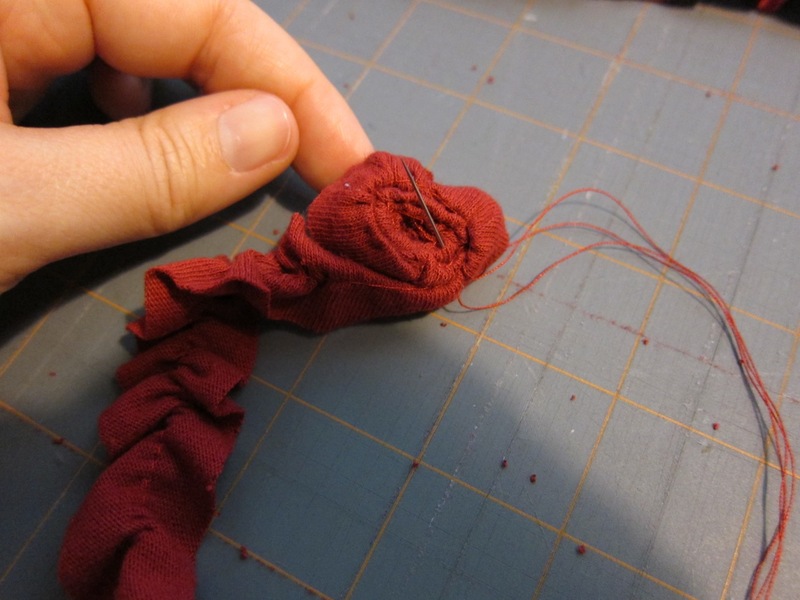 To make the string, just pull the t-shirt (jersey) fabric. It stays shaped like a snake! 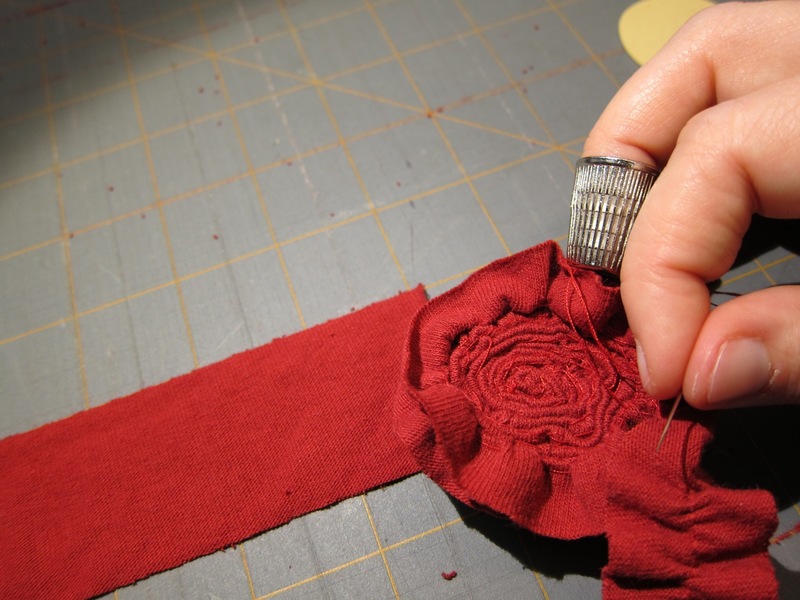 Sew the rose strips down the middle with a gathering stitch (long stitch). 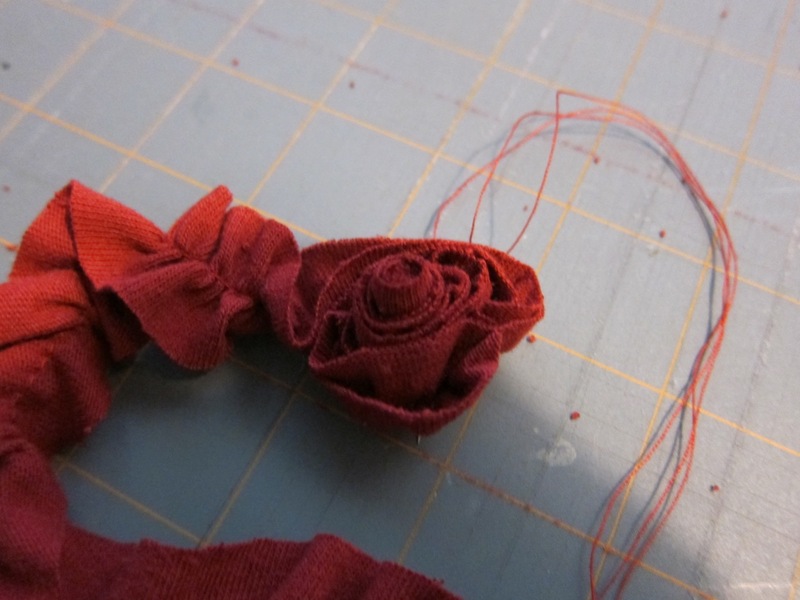 Fold the ruffles in half lengthwise and sew them round and round into a rose. 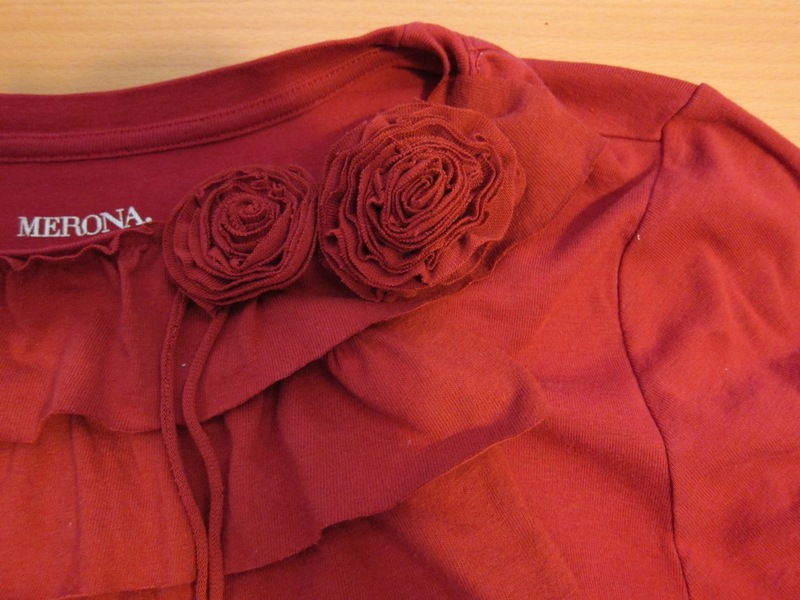 Add the roses and the string to the collar. 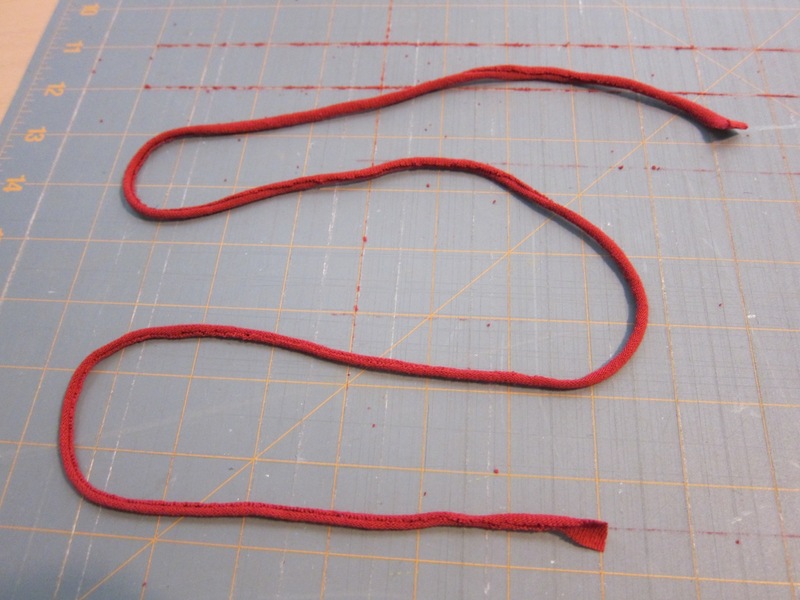 I ended up trimming the length of the string. 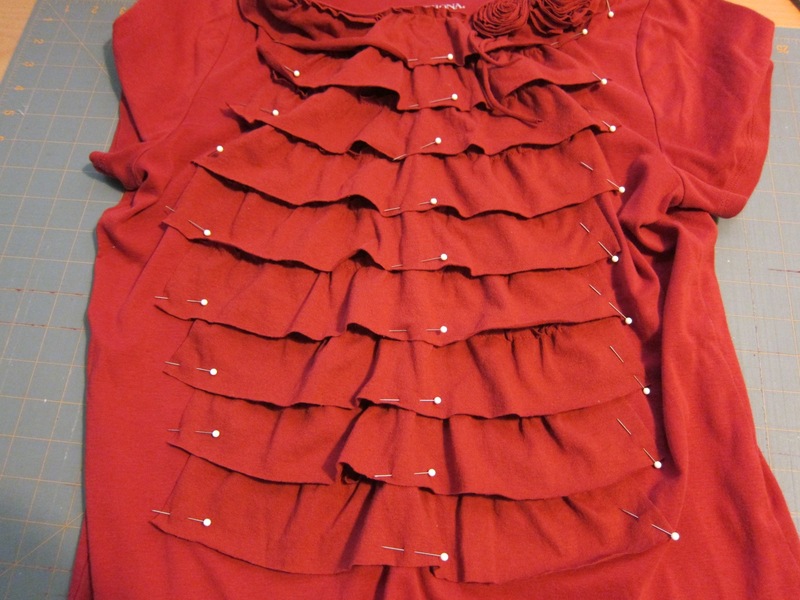 I wanted to tack the ruffles in place, so I pinned them down. 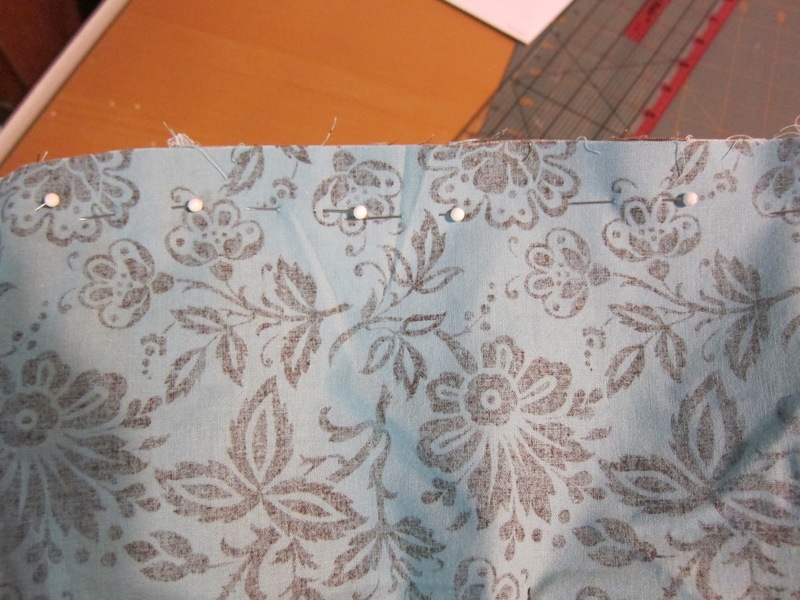 I used my machine to tack the ruffles in place. 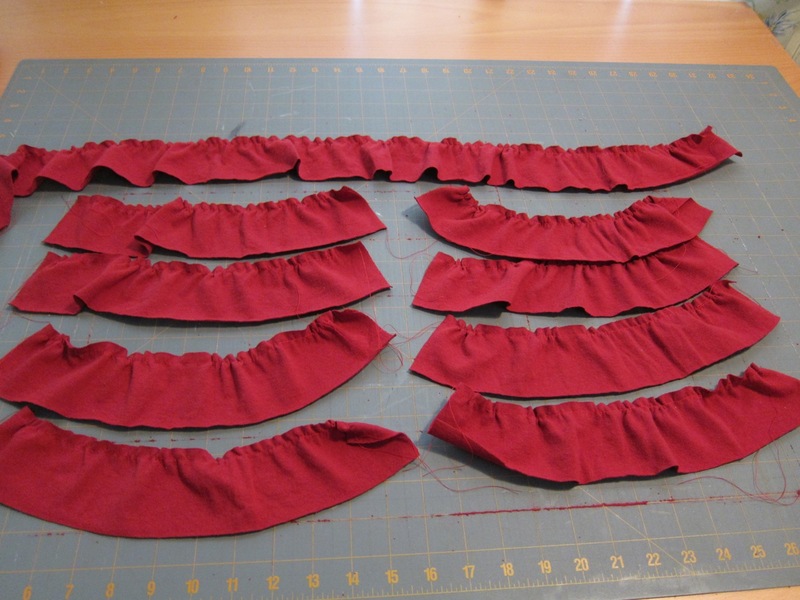 I ended up only tacking them in place at the ends of each ruffle. Voila! 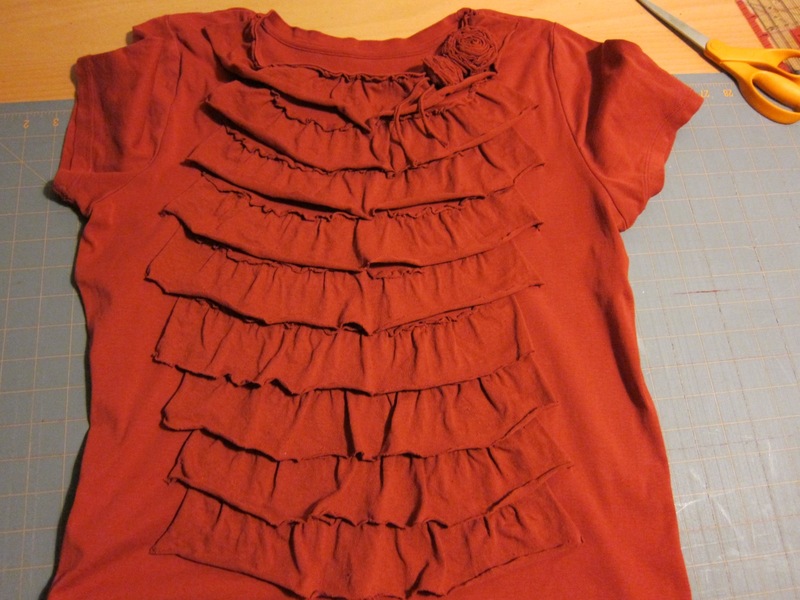 The completed ruffle shirt! 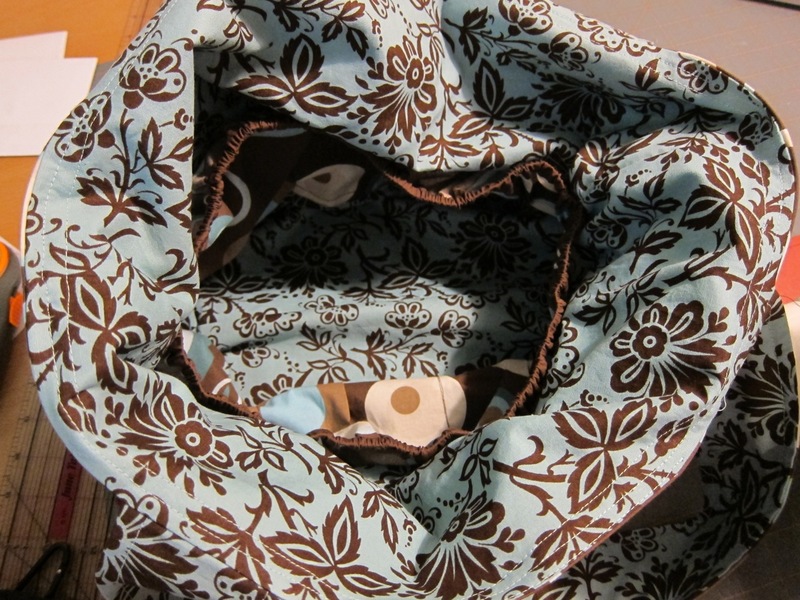 This is Part 6 of sewing a diaper bag. 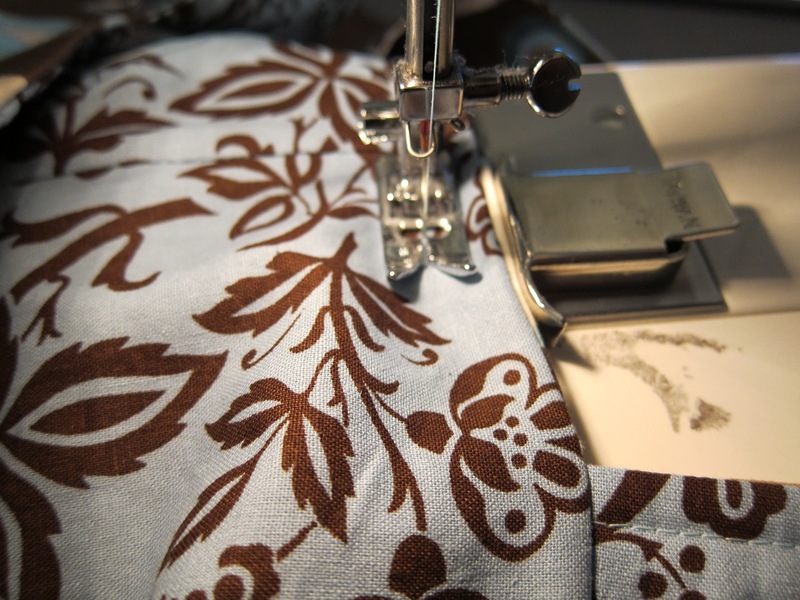 Click here for the instructions. 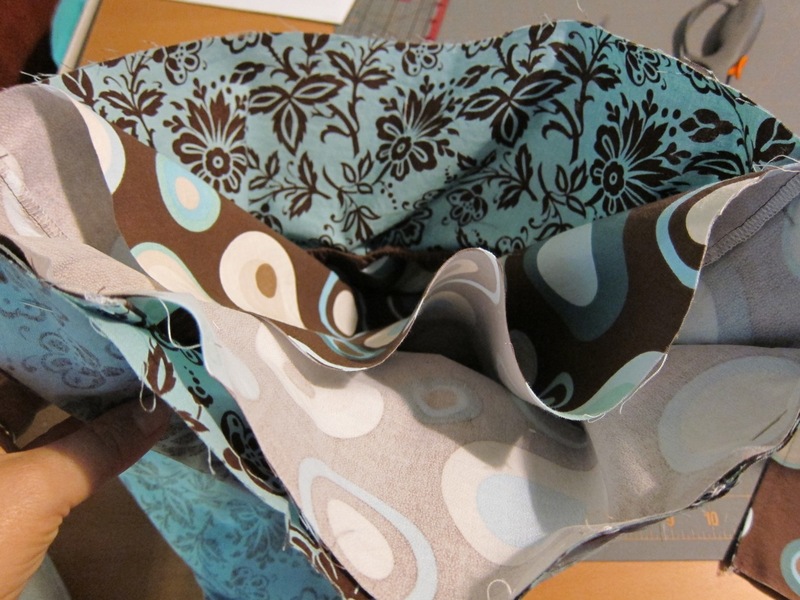 So far, we’ve made the interior and exterior pieces of the bag and sewn them together with the straps. 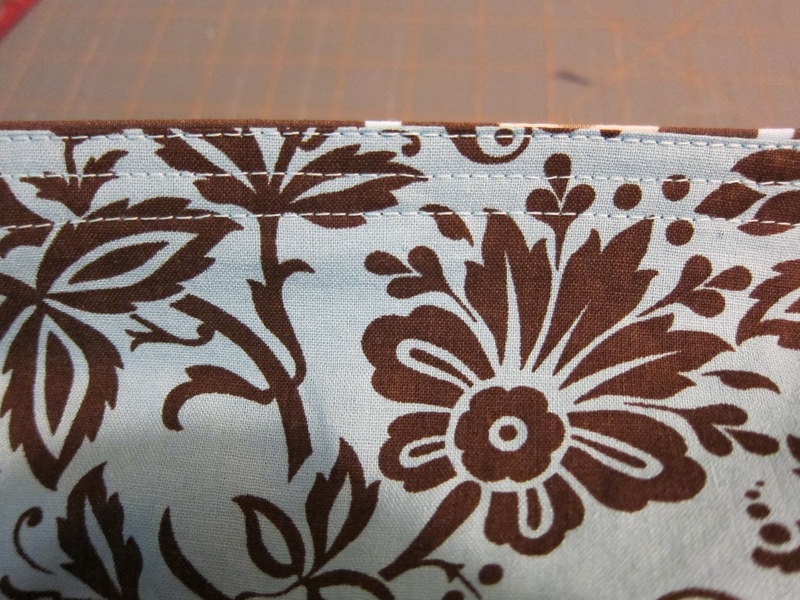 We’ve also added interior pockets. 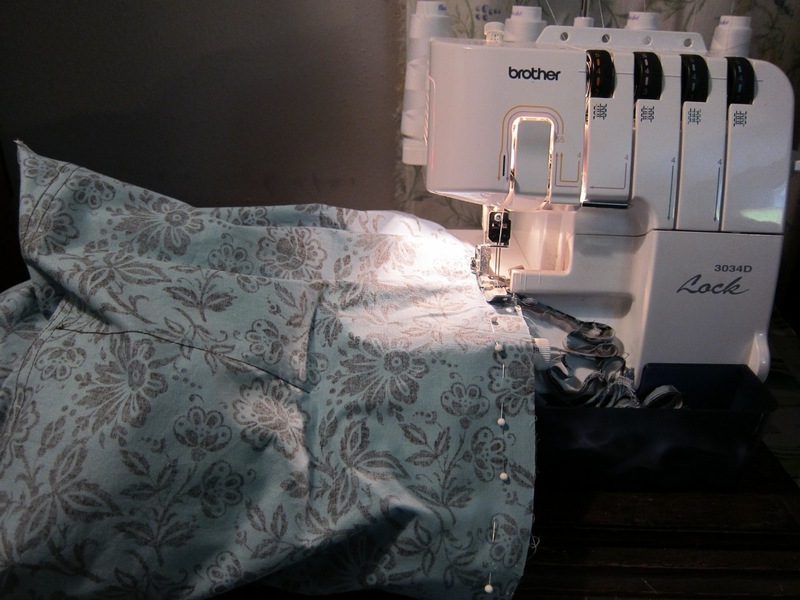 After you sew the exterior and interior pieces together and turn things right-side out, you need to sew along the top edge of the bag. *Note: the instructions call for a flap and a magnetic closure. I chose not to add these to my bag. I can always add something later. 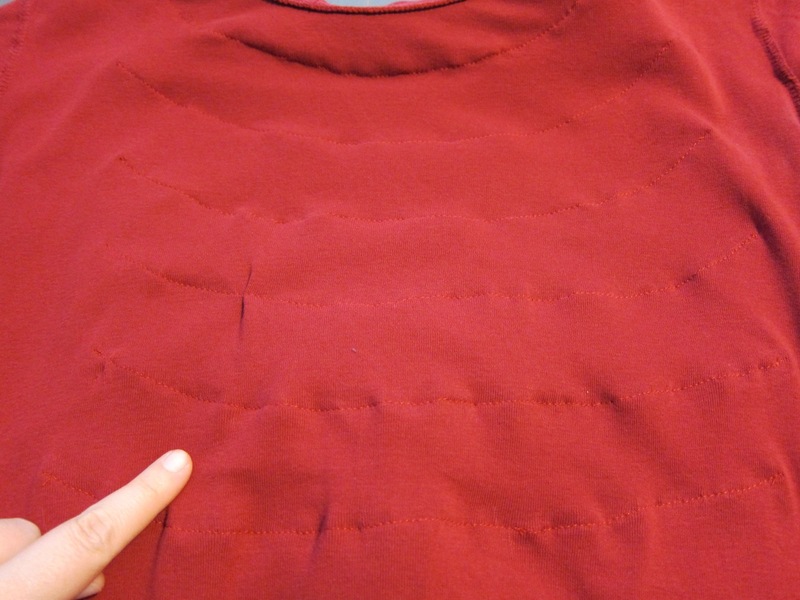 The above photo shows the lines sewn around the top of the bag. 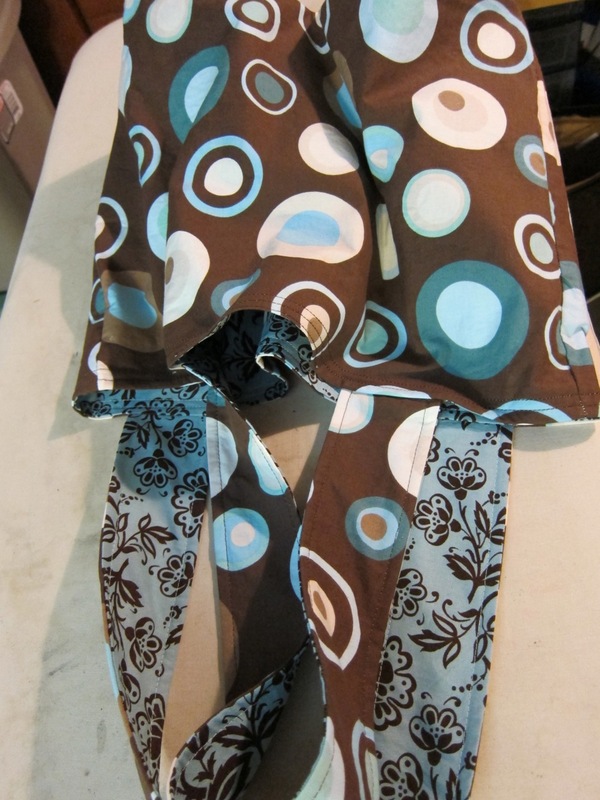 This shows the interior, including the pockets. It’s very roomy. 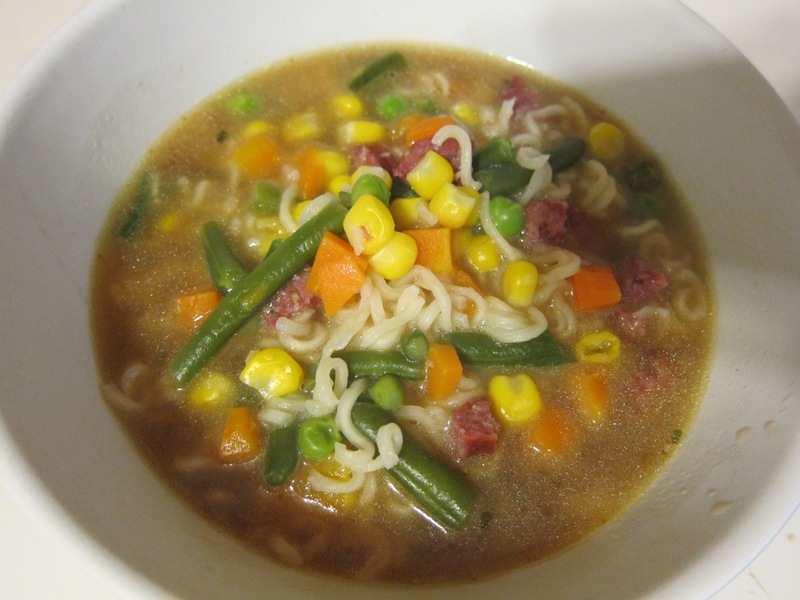 When you first put your two cups of water on the stove to boil, add in some frozen mixed veggies and some sliced sausage (or other meat). Once it boils, add in the noodles and cook for three minutes. After that, add the seasoning packet. Yum! 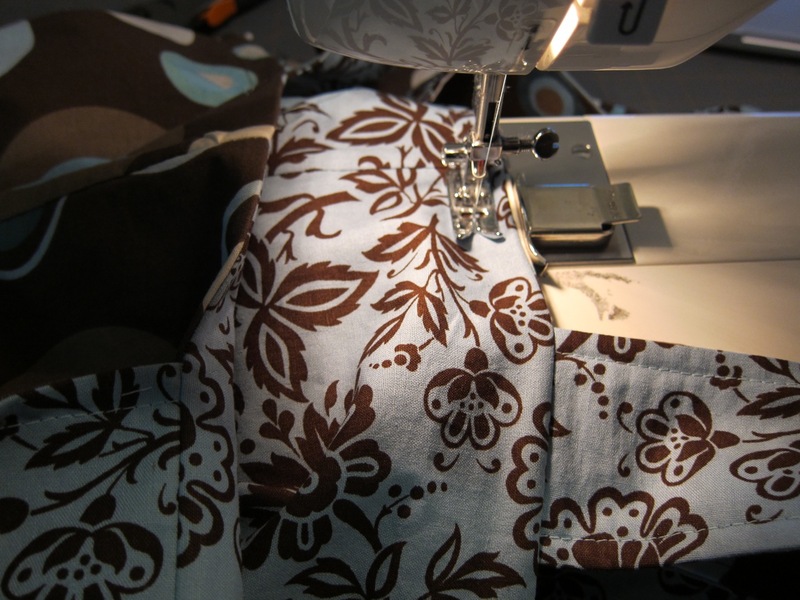 This is Part 5 of sewing a diaper bag. Click here for the instructions. 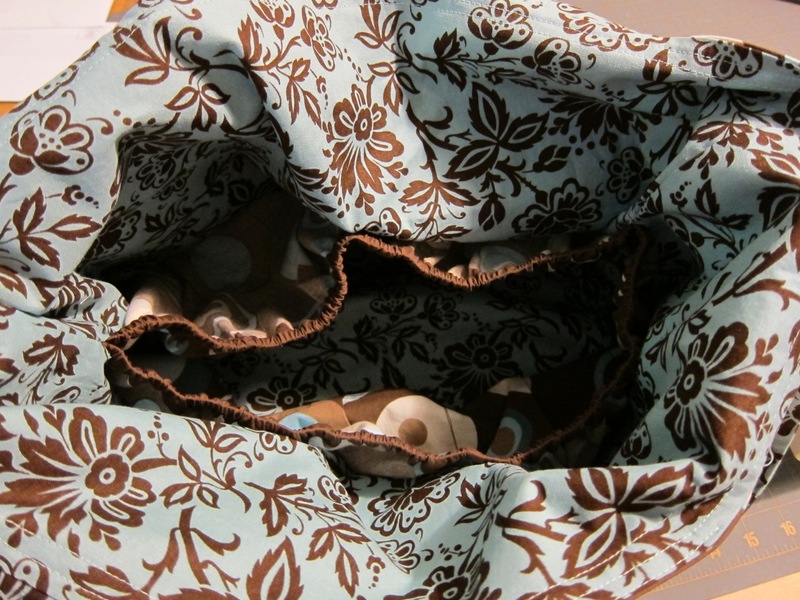 So far, we’ve sewn the interior and exterior body pieces of the diaper bag, the straps, and we’ve sewn in subdivided pockets to the interior. 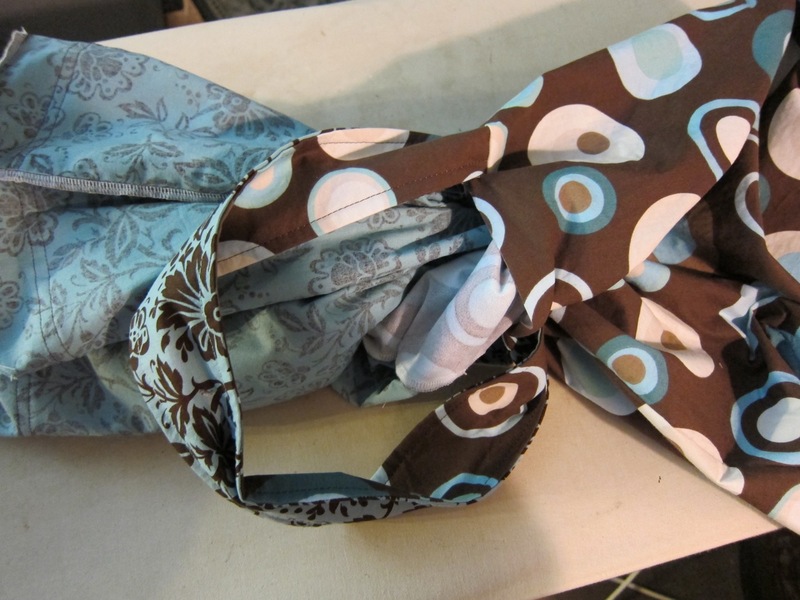 The above photo shows the exterior (left) and interior (turned inside out) of the bag. 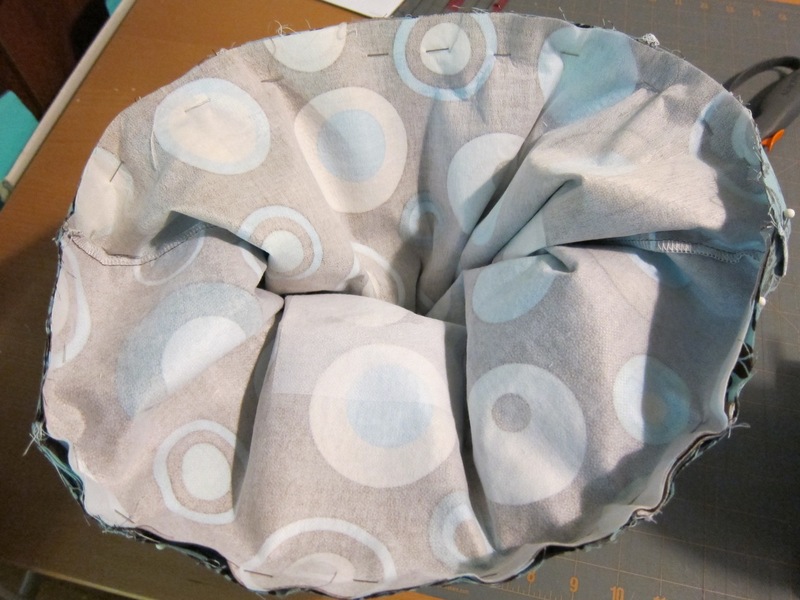 You’ll need to layer the interior and exterior bags, right sides together. 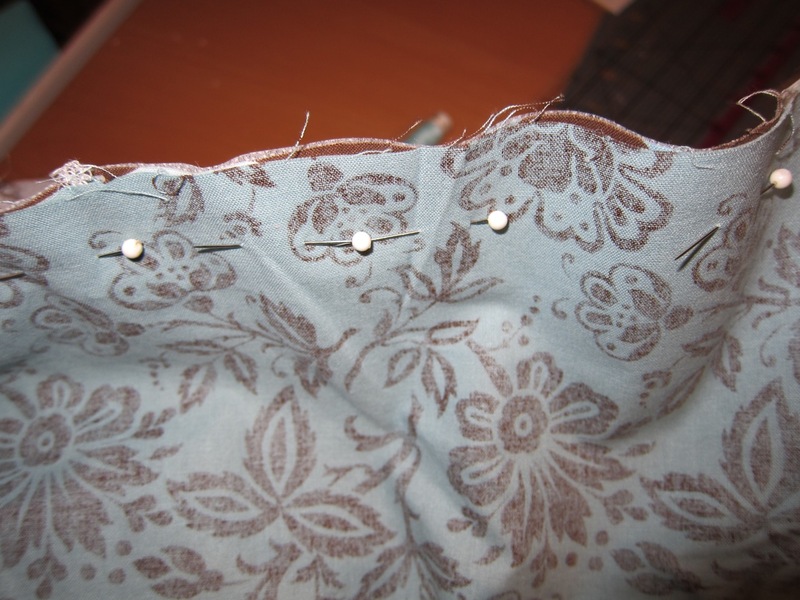 You also need to pin the straps in between the interior and exterior fabrics. 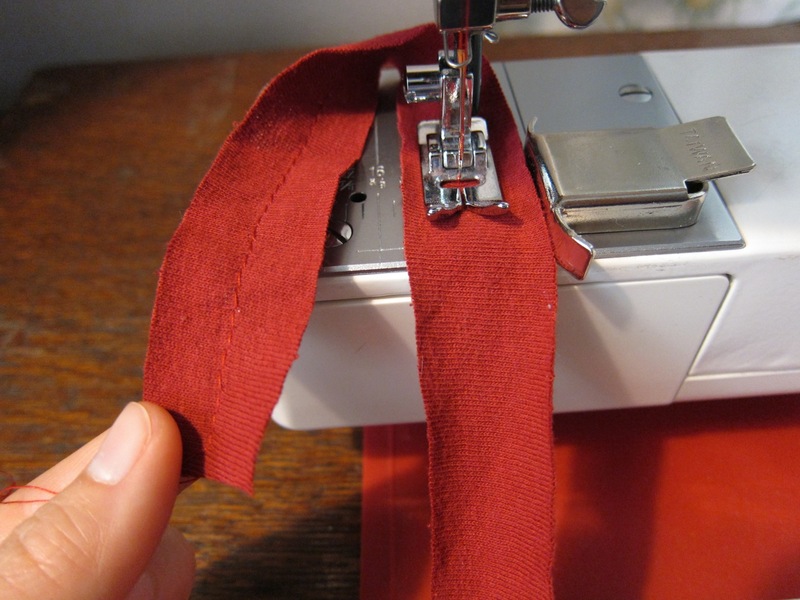 Make sure your straps are facing the correct way, so that the interior (blue) side of each strap faces the interior fabric and the exterior (brown) side of each strap faces the exterior fabric. 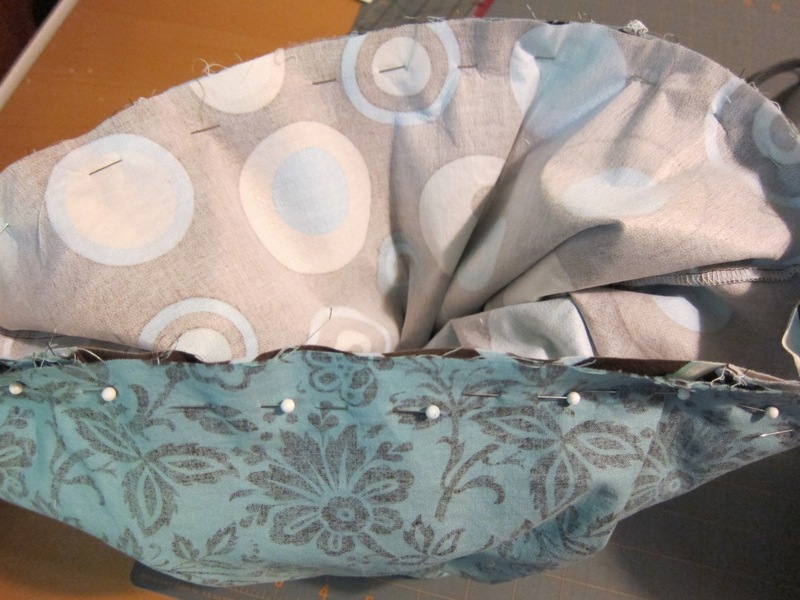 The above photo shows what you’ll see in the process of pinning the interior and exterior parts of the bag together. 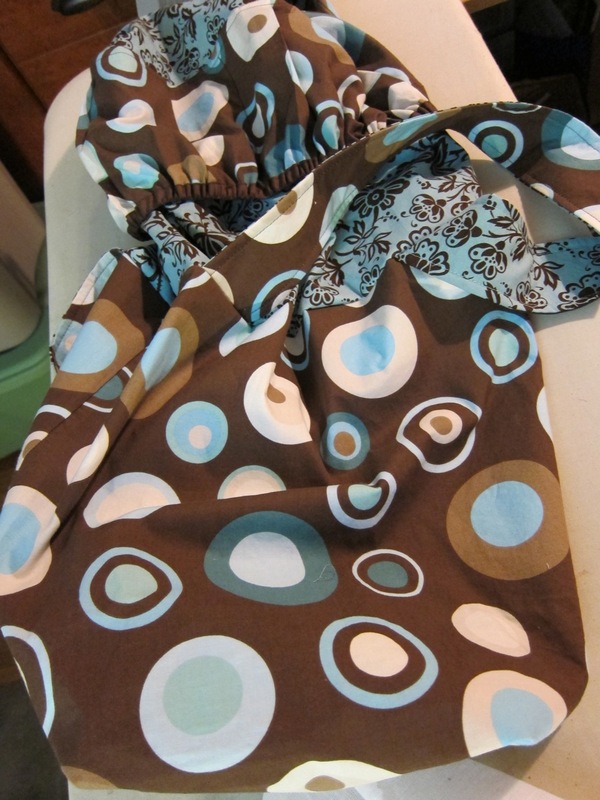 Here is the bag pinned and ready to be sewn (or serged). 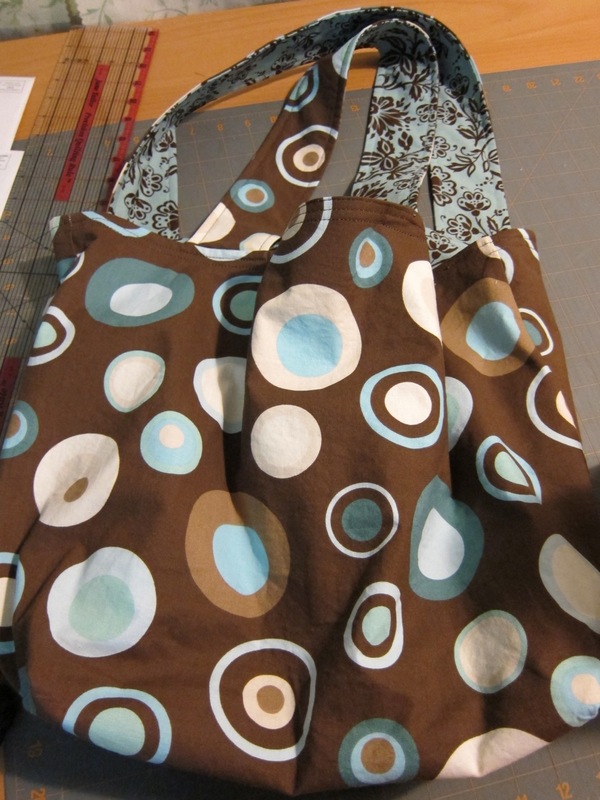 Once sewed, you turn the bag so the exterior fabric is on the outside. Come back in a few days for Part 6 of 6!! 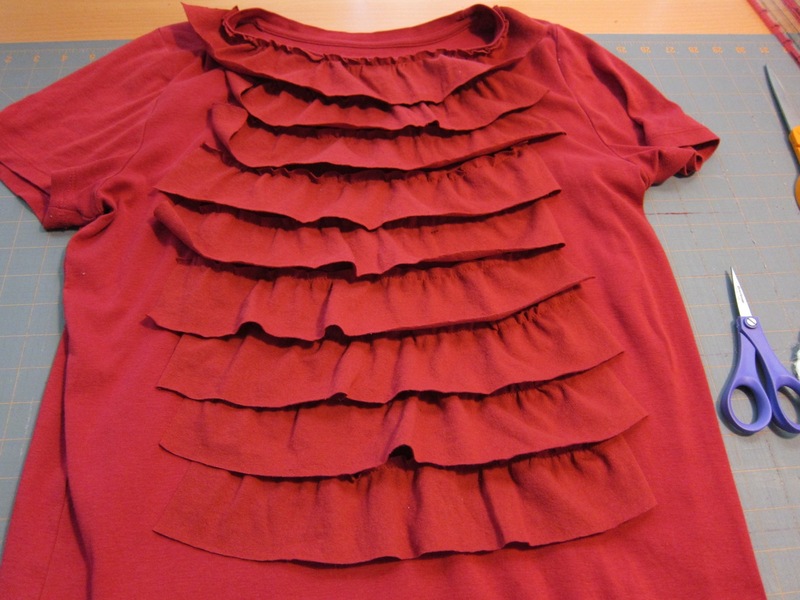 Tea Rose Home has a great ruffle shirt tutorial. Click here for the instructions. 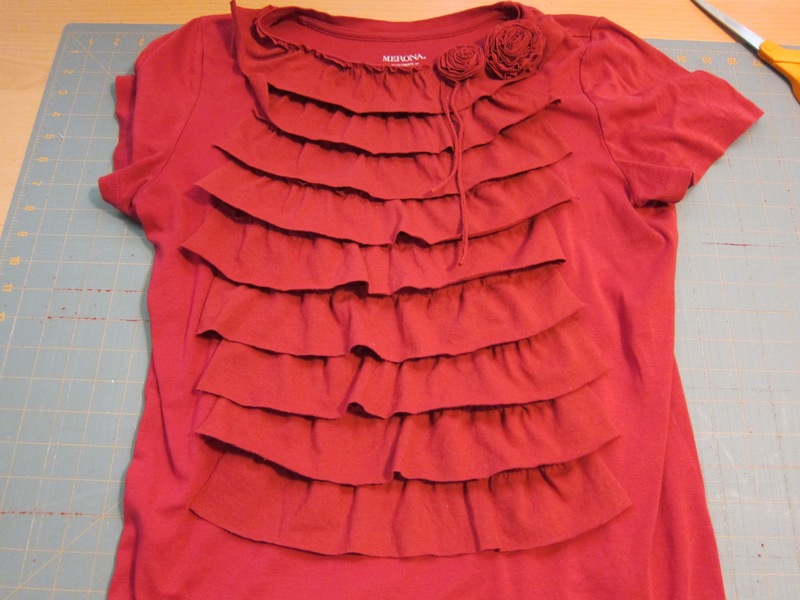 I love all of the ruffle shirts that have been at stores lately. 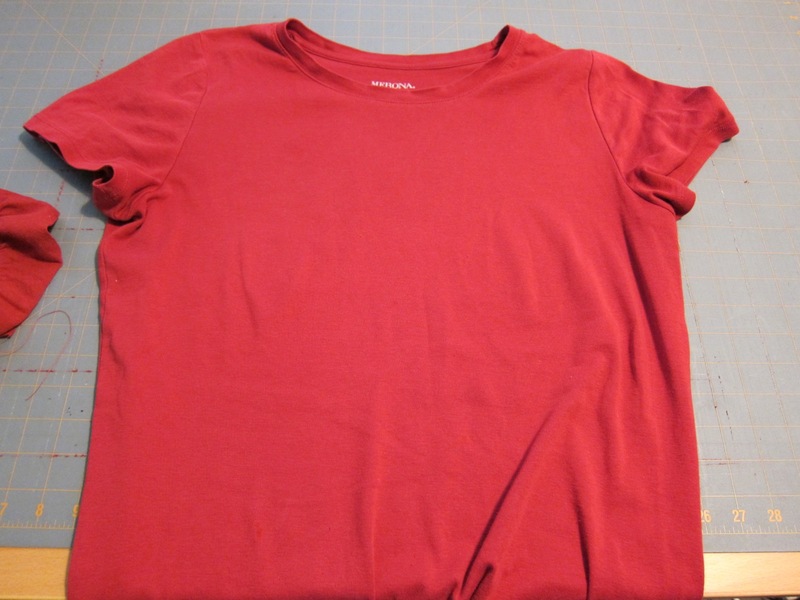 I also love my plain, crew t-shirts. 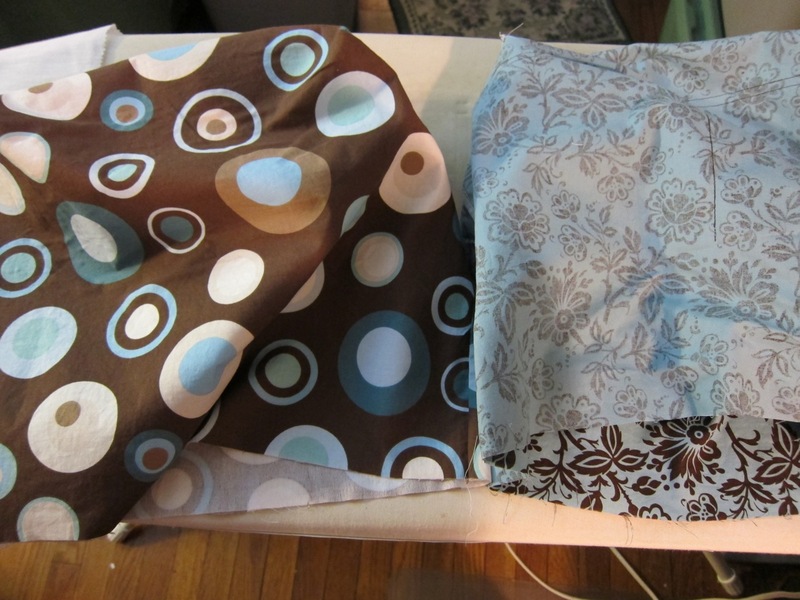 I don’t have to iron them, and the neckline is great. They were too plain to wear to work, so I decided to add some embellishments. 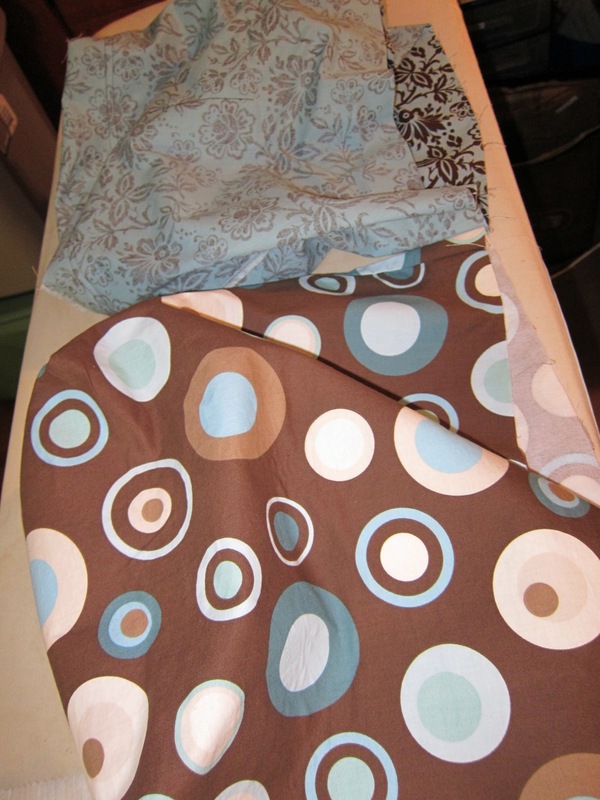 I took my plain t-shirt (right) to a resale shop and matched the color to another t-shirt. 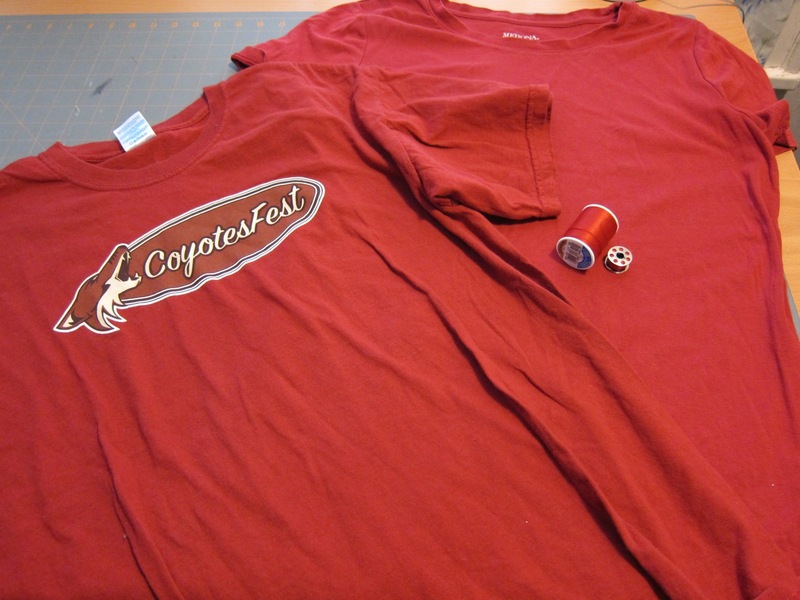 Men’s t-shirts are best, as they are often cheaper and larger (more fabric). 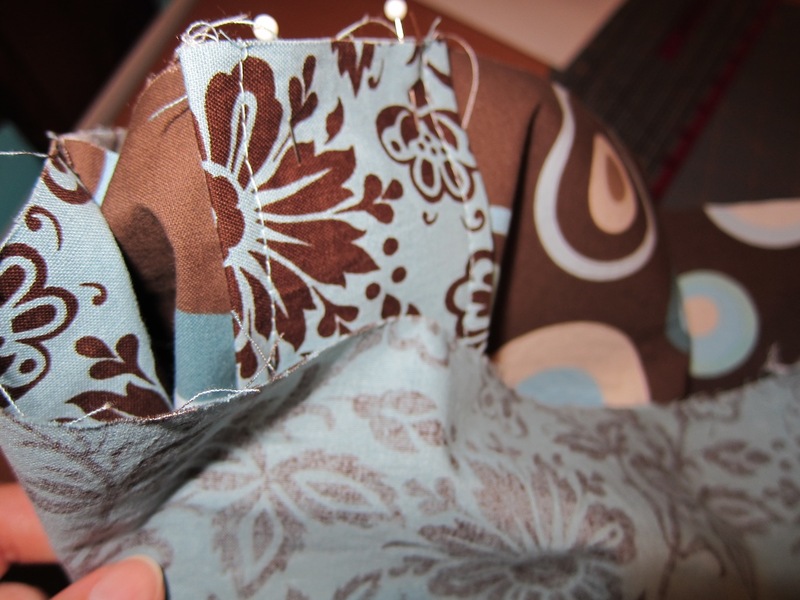 Word of advice: try to get ones without printing, as you can’t use those pieces of fabric. Also, some resale shops have 50% off clothing days. I hit one of those, so it was a jackpot of savings for me. 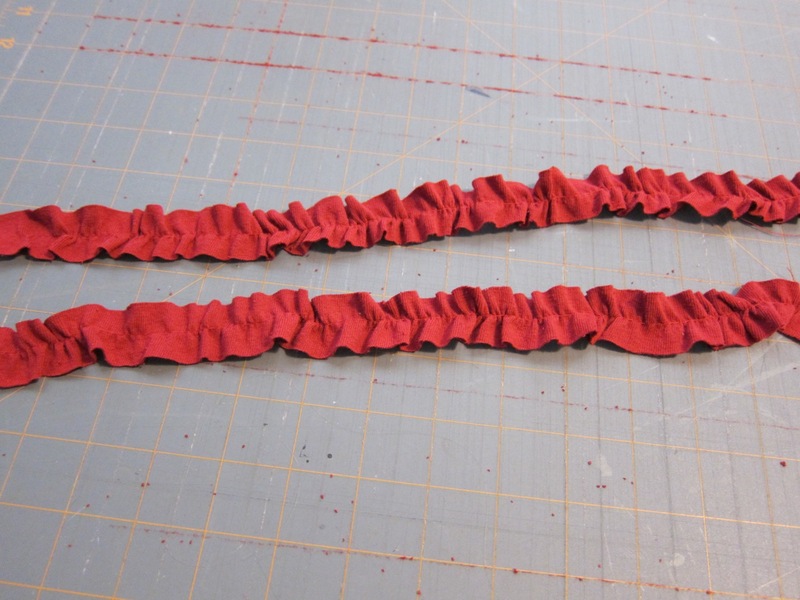 Cut the ends off and cut them to the length specified in the instructions (I think I made these 14 inches long, which is slightly longer than what the instructions call for). 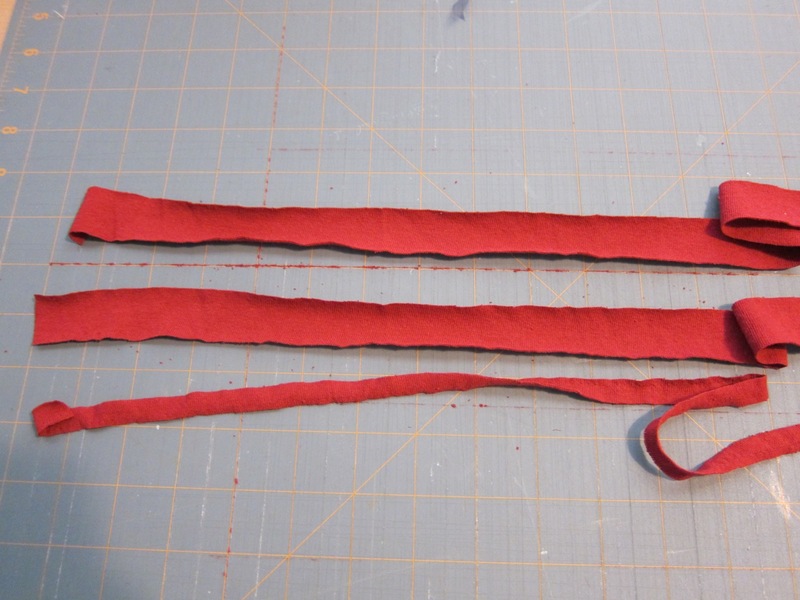 One of the strips will be twice as long. 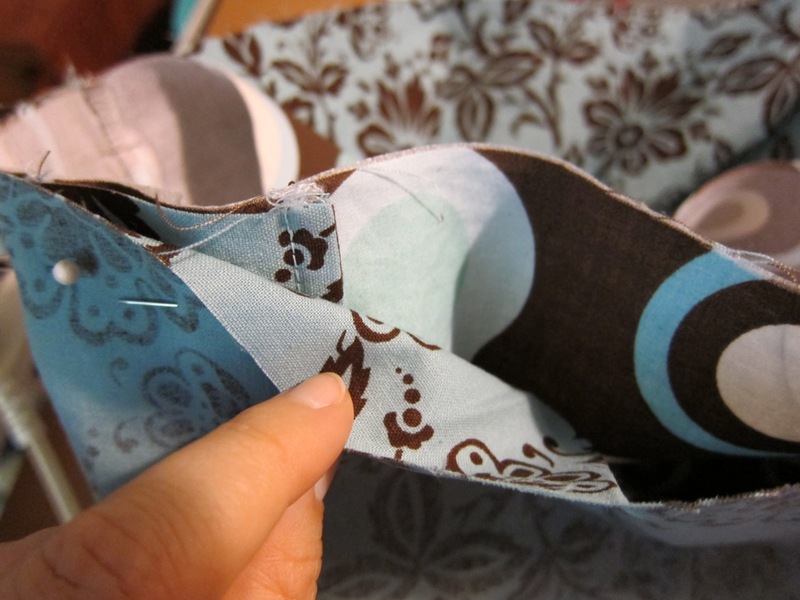 Sew with a gathering stitch and make your ruffles. This is my comfy shirt. 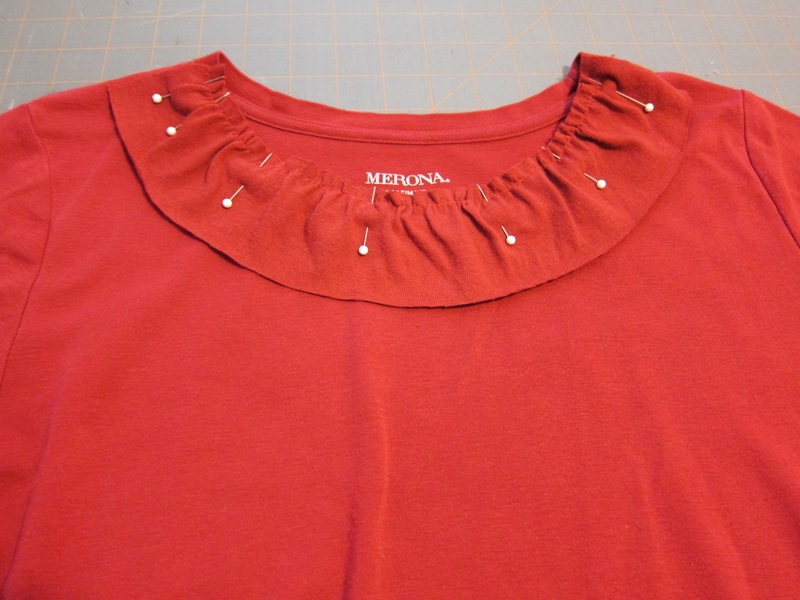 Start adding ruffles at the neckline in front. 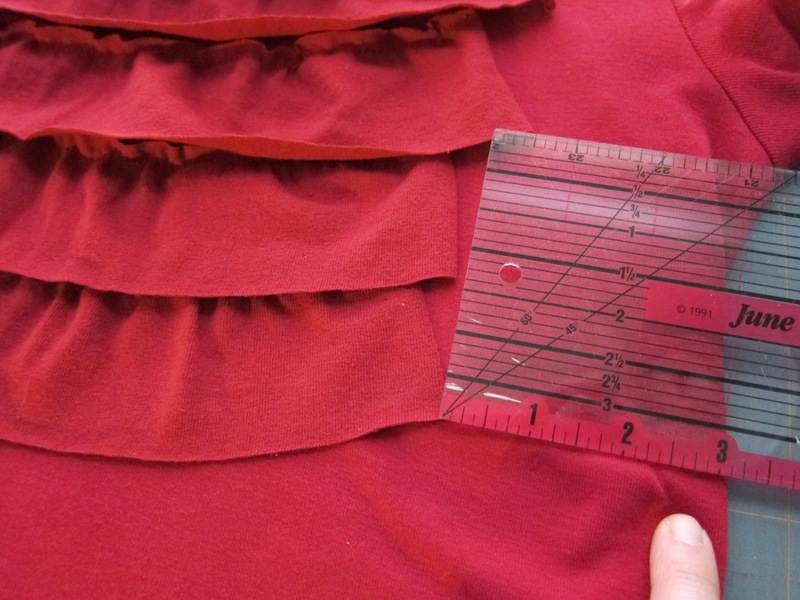 I noticed that my ruffles were veering to the left, so I started measuring the distance between the edge of each ruffle and the edge of the shirt. 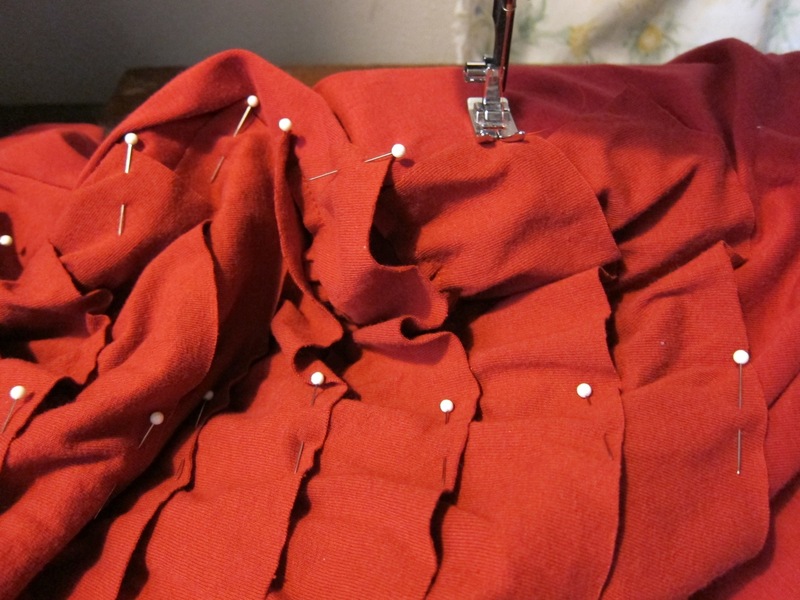 Pinning a ruffle in place. 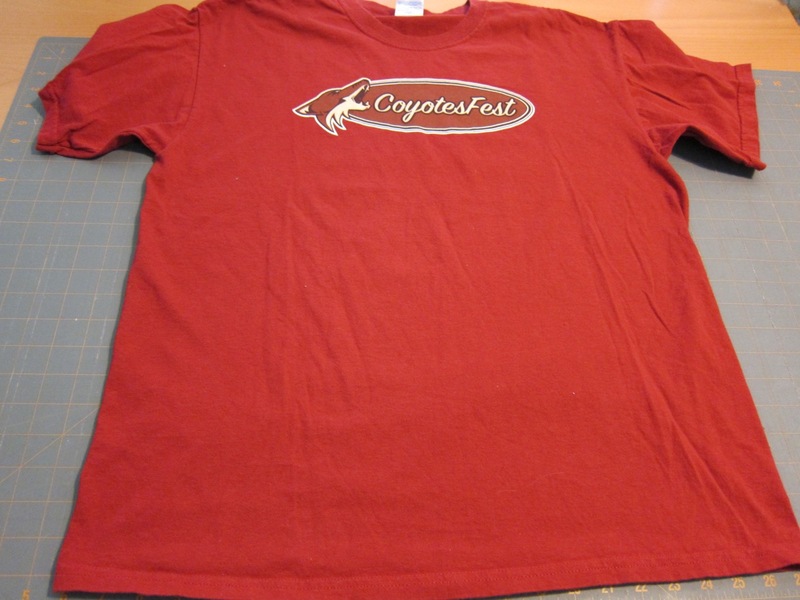 This is the inside of the shirt. 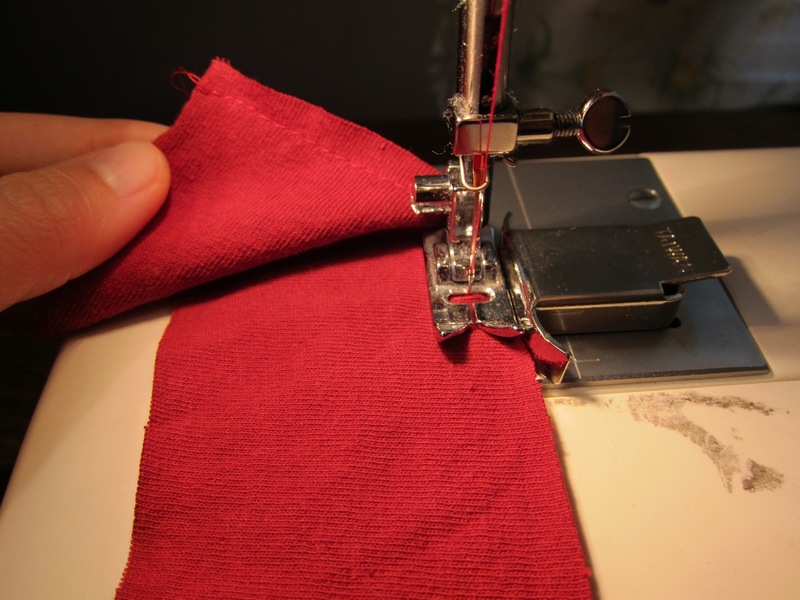 It shows what your sewing lines will look like. 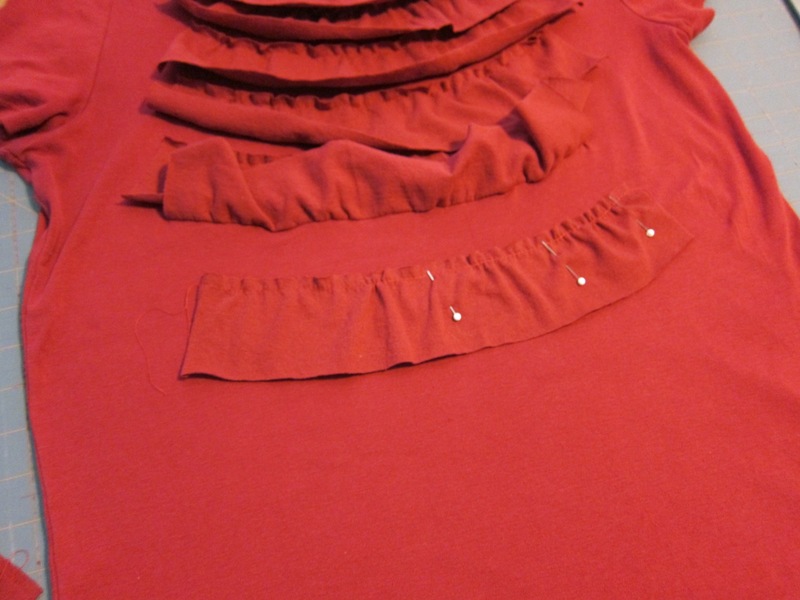 All of the ruffles are on, but the shirt is not done! Come back in a few days for Part 2!